Insider's Guide to Parking. Find parking in San Francisco when others can't. Street parking rules in San Francisco can be enforced and not enforced depending on the national holiday. Take advantage of knowing the rules to get the parking spot that you need in San Francisco. For Saturday July 4, 2016 in San Francisco, some rules will NOT be enforced. Below is a list of street rules and a description of whether the rule is enforced. Commuter Tow Away rules will NOT be enforced. Take advantage of this and park your car in what usually is a tow away zone. Make sure to read the sign so that you don't confuse "Commuter Tow Away" with any other kind of tow away. Receiving a ticket and towing fees can cost you $500+ so be careful. Street Cleaning rules that are NOT "Everyday" will NOT be enforced. Take advantage of this and park your car in what usually is a street cleaning violation of $64. Make sure to read the sign so that you don't park at a street that is cleaned "Everyday". "Everyday" cleaning rules for streets such as Market Street will be enforced. Street Cleaning rules for streets that are cleaned "Everyday" will be enforced. Do NOT park there. You will be ticketed. The hourly limit rules for residential parking will not be enforced. Visitors to San Francisco, can easily visit friends and spend more than the usual limit of 2 hours. A ticket for violating this rule is $74. Because this rule will not be enforced, take advantage of this and leisurely spend time in San Francisco. This is FREE parking for the entire day. Park at a residential spot for free instead of paying for parking. You're going to have to pay for metered parking and all rules that apply to the metered spot will be enforced. Please respect all rules that apply on a typical day; pay the meter and leave the spot before your time limit expires. 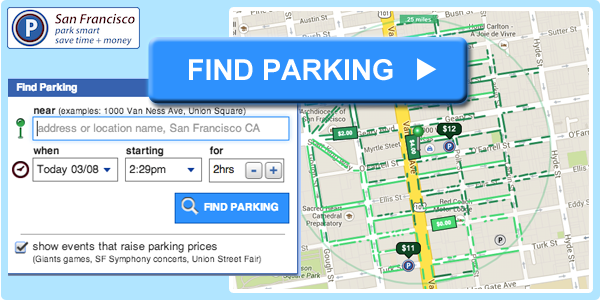 Find Parking Now at www.parkinsf.com!